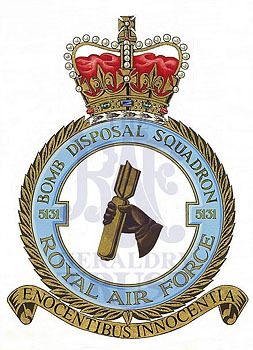 Link: The badge represents the careful handling of bombs which is required when members of the unit are defusing them. Motto: Latin: Enocentibus innocentia – Out of harmful things, harmless things. History: Formed 21 Apr ‘43 and remains current. Sponsored by Peter E Hamlin ex-6204 Flight and dedicated to all RAF Disposaleers.